One of Sierra Leone's top doctors died from Ebola hours after the arrival in the country of an experimental drug that could have been used to save him. Victor Willoughby, who tested positive for the disease only on Saturday, is the 11th doctor in the country to die in the current outbreak. His death has been described as "a big loss to the medical profession". Ebola has killed more than 7,300 people this year in West Africa, World Health Organization figures show. There have been more than 2,470 deaths in Sierra Leone. Healthcare workers are among those most at risk of catching Ebola because it is spread by bodily fluids. Dr Willoughby, 67, died on Thursday, hours after the arrival of the experimental drug ZMapp in Sierra Leone, officials said. ZMapp, which was developed in Canada, has been credited with helping several patients recover, including two US doctors. BBC Africa deputy editor Josephine Hazeley says Dr Willoughby was one of Sierra Leone's best known and most respected doctors. Meanwhile the country's chief medical officer, Brima Kargbo, said the death was "a big loss to the medical profession" in Sierra Leone. "We all looked up to Dr Willoughby and would consult him on many issues relating to our medical profession," he told the Associated Press news agency. 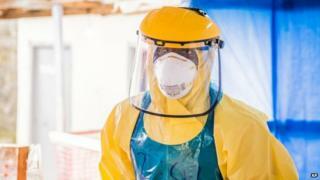 Earlier this week officials in Sierra Leone began house-to-house searches in the capital Freetown to find hidden cases of Ebola. President Ernest Bai Koroma said Sunday trading would be banned and travel between districts restricted in a bid to stop the spread of the disease. The country has also banned public celebrations over Christmas and the New Year.